I saw this on the tire cover of a van the other day. 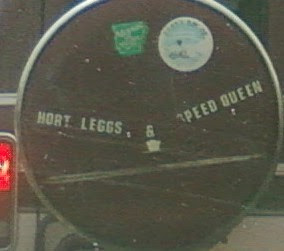 I think I'd rather be Speed Queen. What about you? I don't know. Leggs with two "g's" is pretty cool. How have I missed your blog for this long? I am so impressed that Leisel has been camping!! !